"We have to learn the rules by heart. There is but one lesson here, endlessly repeated, over and over again. We will learn very little here. None of us will amount to much. Later in life we will all be something very small and subordinate." My first exposure to the world of the Brothers Quay would have been their stop motion work in Peter Gabriel's Sledgehammer video. Identical twins born in the United States, Stephan and Timothy Quay developed their craft of puppet films in England, where support for more experimental animated film work is much more respected and accepted. The pair produced a number of stop motion shorts (see Dan Lopez' review of Kino's The Brothers Quay Collection), primarily influenced by European animators. As their first live action feature film, I was curious what aspects of that stop motion background would surface within Institute Benjamenta or This Dream People Call Human Life. 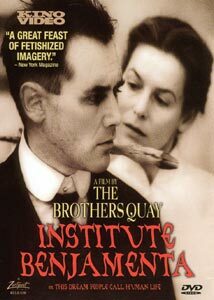 The film is based on Swiss author, Robert Walser's Jakob van Guten.We are taken to the Institute Benjamenta, a place where the art of servitude is taught. The main character Jakob (Mark Rylance) admits he will never amount to anything, but may be worthy of serving others. His task is to memorize the procedures, endlessly repeated under the tutelage of the disturbed headmistress Lisa Benjamenta (Alice Crige) with her deer footed pointing staff, and her tyrannical brother (Gottfried John). Although he aspires to live in mediocrity and anonimity, Jakob is singled out by his teachers. The experience of his training is interrupted by dreamlike interludes with brother and sister confiding in their servant, changing the dynamic and order of the Institute, and manifesting dreams of fairy tale images and abstract forms. The film is very surreal and pleasingly disorienting—I couldn't help thinking of Caro and Jeunot's The City Of Lost Children or the films of Terry Gilliam while watching it. Though it doesn't rely on the gadgetry I'd associate with these examples, they share a similar feel in their visual stylings. Nic Knowland's cinematography offers fresh, yet haunting visuals with each scene. It is not surprising to see the level of detail in the lighting and camerawork coming from masters of stop motion, where every frame is carefully composed. There is always something going on in the picture, though it is often out of focus or abstract—light and shadow moving through the scenes or shifting focus and depth of field. The artistry is very evident in the use of the black and white spectrum—in several sequences, rather than delivering an image ranging from white to deep black, the tones hover in dark grey in an almost disturbing fashion, only to be finally grounded by the introduction of darker tones later in the scene. There is a very antiquated look to several parts of the film due to the soft filter and overexposure, and the fusing of fantasy and reality conjure hommage to Cocteau. This is a very beautiful film, filled with exquisite imagery and interesting composition, the eye is never left without something to ponder. I had no idea what to expect from this film, but having discovered it now, there is another unique gem in the collection. Exquisite, delicate, yet with an underlying malaise, this film is a definite recommendation. Image Transfer Review: Institute Benjamenta is presented in non-anamorphic 1.66:1. Subtitles, which bookmark the film, are burned in. The image is intentionally soft, as are the contrast levels which often don't render down to solid black, but leave us hanging with midtones. This definately gives the film a unique look, giving the impression of watching an older film. Some grain is present as it should be. The image is flawless, with no signs of any digitally induced artifacts other than a few minor aliasing occurances. The very surreal black and white imagery is presented perfectly here. Audio Transfer Review: The two-channel mono sounds great, with no anomalies to report. Lech Jankowski's score is well presented, and its mostly minimalist instrumentation suits the film perfectly. Whether we are listening to a choir accompanied by string bass, or a harp with saxophone, the sound is clear and present, with only a small amount of distortion present in one or two places. There is no noise to speak of. Dialogue is clear, and multiple languages within the same sentence are handled with attractive subtitling. This 15 minute piece features a behind-the-scenes look at the shooting of several scenes from the film, with the finished shot cut in for comparison. It offers a glimpse of the process of filmmaking during the actual shooting. There is no voiceover or narration other than excepts from the film, but we get a good look at the sets and preparation for filming, plus a different perspective on the final performances. The featurette was shot on video, so the image quality isn't outstanding, but it does give us a very intimate look at parts of the production we would otherwise never see, and it makes a welcome change from talking heads doing advertisements for the film. This 5 minute piece barely introduces us to the Brothers Quay (Stephen and Timothy, though we are never formally introduced to either), but does offer short excerpts from their animation work cut into interview footage. Also shot on video, the image is acceptable, though not great. Still, an interesting, albeit brief, diversion into the minds of these young men. Institute Benjamenta will not be a film for everyone, but for those who appreciate exquisite filmmaking, lush visuals and surrealistic images, this comes highly recommended. Kino has produced a beautiful transfer of the film, and a couple of very nice supplements.